The lovely people from Gekko invited me out to dinner last week. They like my blog and wanted to chat to me about potentially linking to my reviews on their hotel and restaurant website. I was pretty chuffed. It’s really rewarding to get positive feedback from readers to a point where they like what you do and want to get involved with you. Their restaurant of choice was The Hawksmoor, a British steakhouse on Commercial Road. In a split second decision that would haunt me, I decided to drive rather than to take the tube. A combination of bad traffic and getting lost worked against me and I ended up being 45 minutes late. Surely this is not a way to make an impression on people you haven’t yet met. But like I said, the crowd from Gekko are really lovely and they were entirely understanding of the situation. 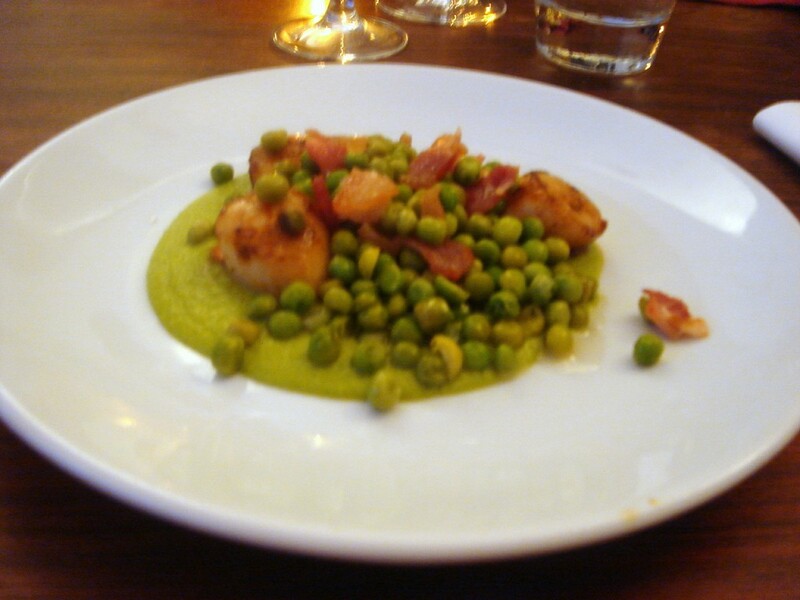 I started with a dish of scallops, bacon, peas and pea puree (£9) which was poor. The scallops were a little rubbery, the bacon was not crispy, and the peas were a little cold. The pea puree was also a little peppery. Overall this was not a pleasing dish. 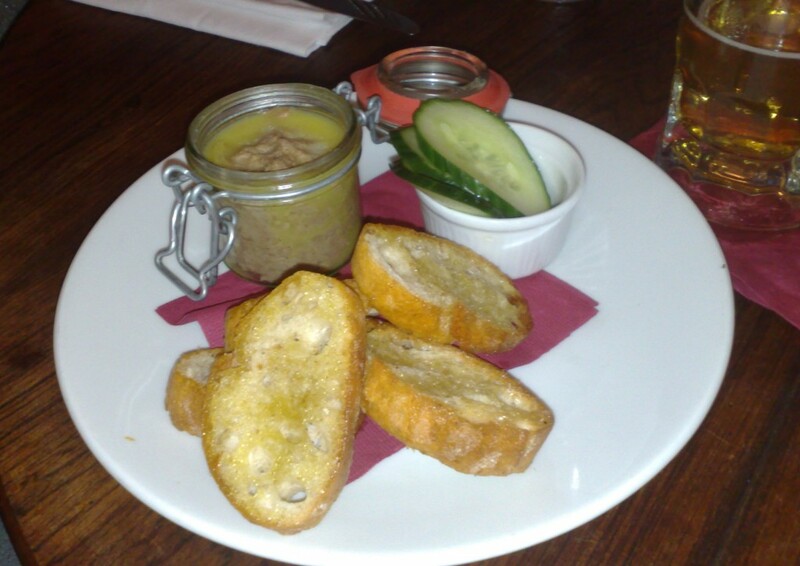 Another starter of potted Yorkshire beef (£6) was better. The beef, potted with fat, was luxurious and velvety smooth. But it came with a bread which had been toasted and become so hardened it was almost like trying to bite into a brick. To the steaks and all three of us settled on different ones. Most of the steaks on offer at The Hawksmoor are from Longhorn cows (and according to the restaurant’s website, Heston Blumenthal’s favourite breed of steak). They are slaughtered at 30 months, rather than the typical 12-18 months, reared naturally, and hung for 35 days. A 400gm piece of ribeye (£21.50) was extremely tender and juicy, but it came served rare, rather than the requested medium rare. Clark had suggested that we might try a Shorthorn rump (400gm at £19.50) for it has a nice gamey flavour, and it certainly did. But it was extremely chewy, and I found eating even one mouthful a little hard work, so I could only imagine that eating 400gm of it must be similar to giving your mouth a workout. Indeed, when R finished with the Shorthorn rump, he was exhausted. Again this steak had been cooked rare, rather than the requested medium rare. To my steak which was a fillet (£30 for 300gm). The cut I was provided with was interesting as one end of it was much thinner than the other, and therefore you instantly knew that the thinner end would be cooked more than the other. I attacked the thicker part first, which was medium, rather than the requested medium rare. This was surprising as the other steaks had been cooked rare. I pointed out that the steak had been overdone to Clark, and he was ever so apologetic, sending it back for a new piece without me having to ask. The second piece turned out quite thick, with the centre being rare and the rest of it being medium rare. If ever there was a case for sous vide, this was now, but then the steaks wouldn’t be charcoal grilled. Nevertheless, the steak was simply superb – meltingly tender, juicy and flavoursome without any sinew or noticeable fat running through it. Clark in his I-want-everything-to-be-just-right-manner wanted to send it back for me again because he thought it wasn’t perfect, but there really was no need. The steak spoke for itself and was just delicious. Clark tried to explain away my first piece of overdone steak by saying there was a new Chef in the kitchen and that he had selected a piece which was better suited for medium rather than medium rare. Still, one doesn’t go to a restaurant to pay for inconsistencies. 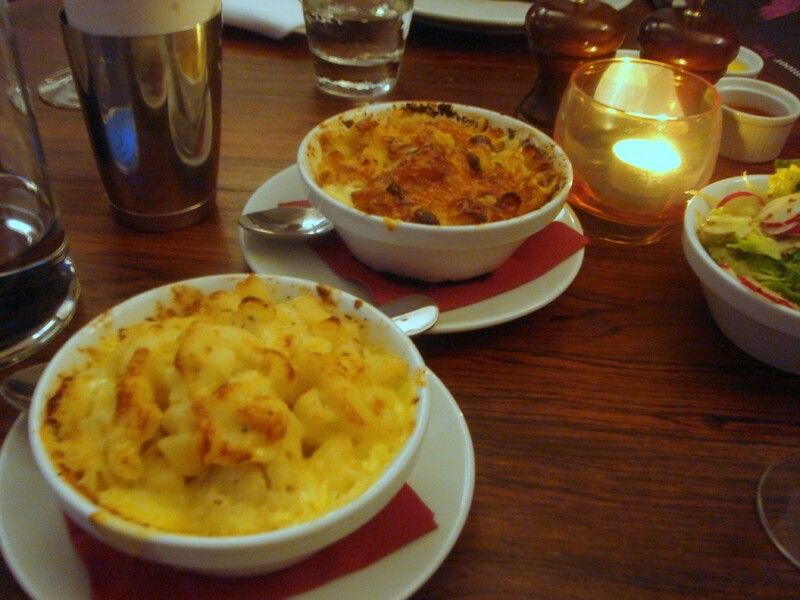 To further demonstrate this inconsistency in the cooking, you will note from the picture taken of the two macaroni and cheese sides (£4 each) that we ordered that one was more browned on top than the other. I tried the macaroni from both the dishes and found them to be a little bland, with the pasta itself to be slightly overcooked. We also ordered the triple cooked chips (£3.50) which were delicious, although a baby gem salad was a little limp (£4). Desserts were a dream. A pina colada sundae (£6.50) tasted like a tropical island paradise on the tongue, cold and refreshing, and a summer berry fool (£6.50) was creamy, fruity and luscious. There is no doubt that the quality of the steaks are of a superior quality with lots of flavour (although I don’t think I can recommend the Shorthorn unless you fancy lots of chewing). But no one steak turned up cooked exactly as requested, and this detracted from the fact that the steaks were so good. That excellent fillet came at a price – £30, which might be hard to stomach if it isn’t perfect. Perhaps when the new Chef settles into his routine, the cooking of the steaks will be better judged, and if not, there seems to be no issue with sending them back to have them done just right. As for the rest of the meal, I can’t say I was enamoured with the starters or the sides other than the chips. 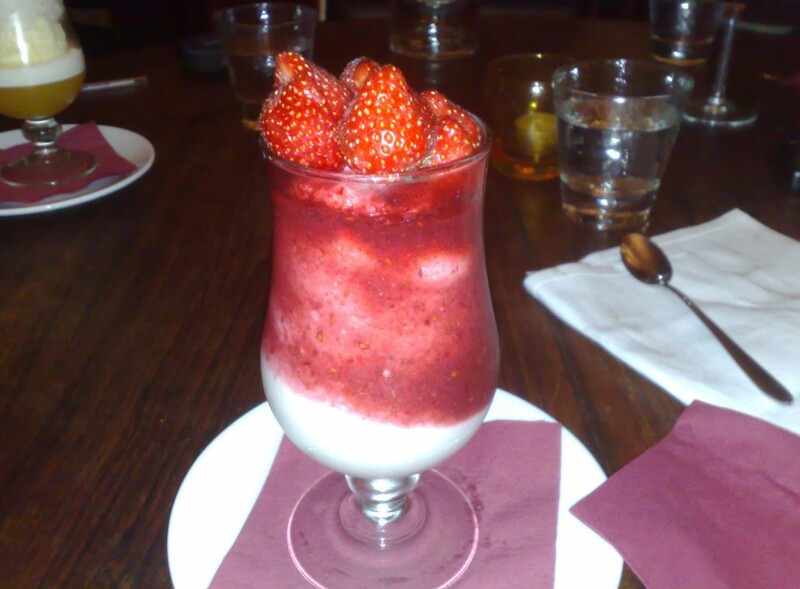 But that said, the steaks are filling enough, especially if you finish with one of the excellent desserts. And for what it was worth, the service was fantastic. Even the manager came over afterwards to apologise for my fillet, which co-incidentally they took off the bill. Overall, it was a lovely evening, but choose carefully if you decide to visit The Hawksmoor for it isn’t necessarily cheap. Price range – Approximately £28 to £56 for 3 courses plus a side. Excludes drinks and service. oh well. i guess time to try Goodmans? ?or the Palm?? lol… steak cooking is a no brainer yet it seems no one can cook it correctly. 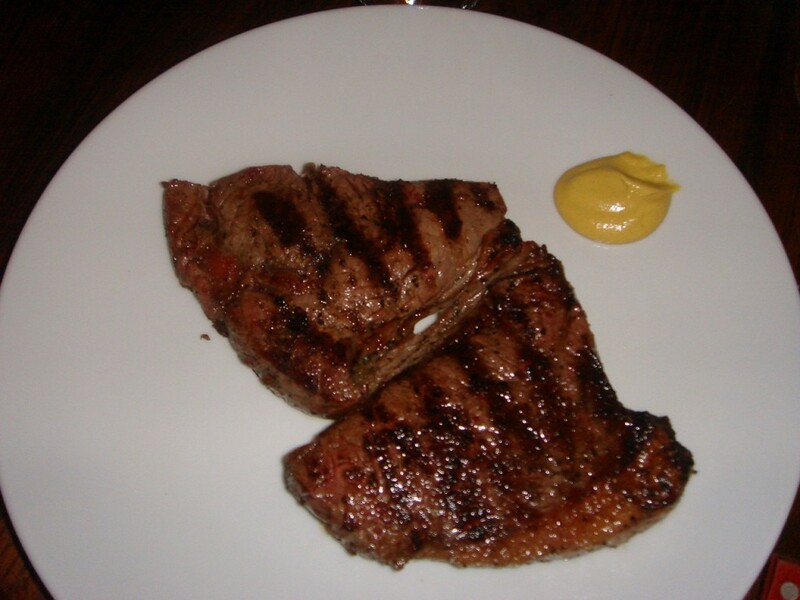 You just have to read my review of Alain Ducasse – rare fillet steak comes to me medium well. I haven’t heard good things about the Palm, but I shall think about Goodmans. This experience wont put me off going to the Hawksmoor again. I think it deserves another try. Hi G, I know! Isn’t it silly how easy it is to get steaks wrong! What a shame. 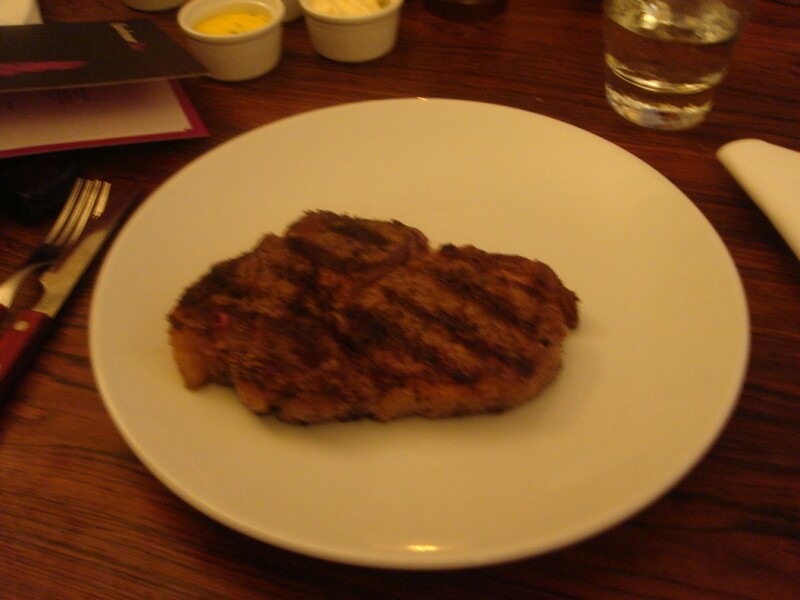 Hawksmoor is my favourite for steaks, but aside from chips and some greens I didn’t order anything else there. Sorry you had a poor experience here, as I’ve always found it to be excellent, and the cocktails are outstanding. My only complaint is that beceause of all of the hard surfaces, the accoustics are very bad. It’s always lively in there and on a few occasions, I’ve found it impossible to hear the person sitting opposite me. I could only really comfortably talk to the person sitting next to me, which is a bit of a pain as you know how much I like a chat! Sounds disappointing but probably not as bad as a steak I had at a young’s pub on the weekend. Mind you @ £12 I probably should have ordered the fish and chips. Well done on the gekko thing though. Nice to be wanted. I loved the Hawksmoor when I went so was eager to read your review. We had some fab coctails by Pete the aussie bartender, and our steaks were wonderful. I do agree they like to cook them rare! I am really looking forward to going back. Fair point. But if you are paying for a service, I think you have a right to comment on whether you thought what you paid for was worth it. 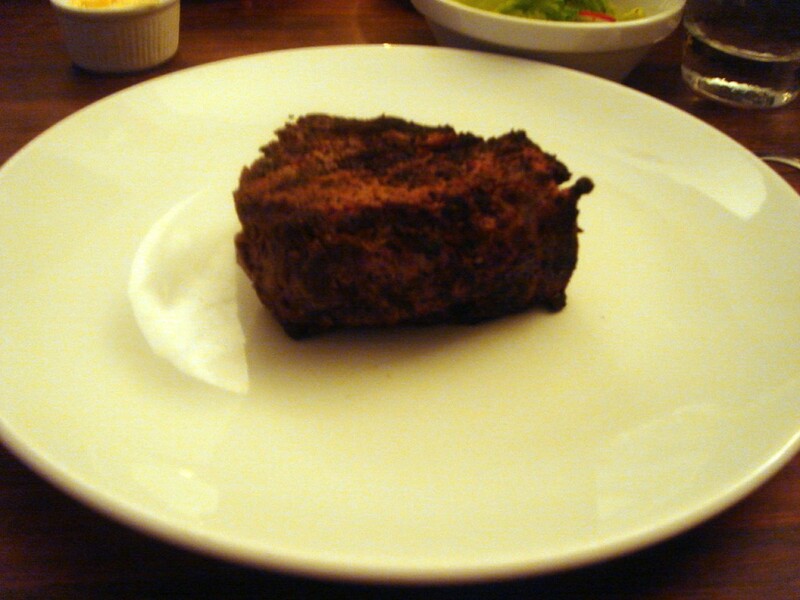 We visited the air street Hawksmoor last night and had a very similar experience. 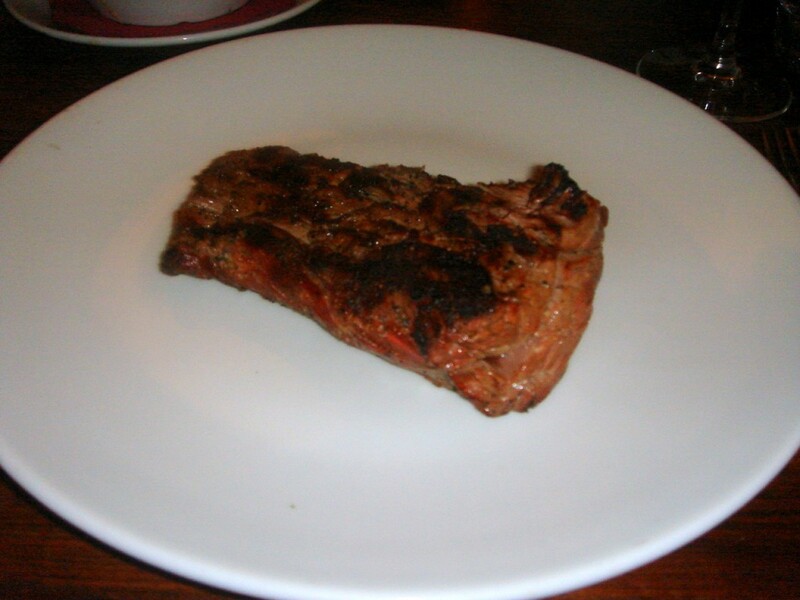 I asked for my steak rare & it was medium rare. When you are paying that much for a fillet of steak you want it cooked as asked. Shame!